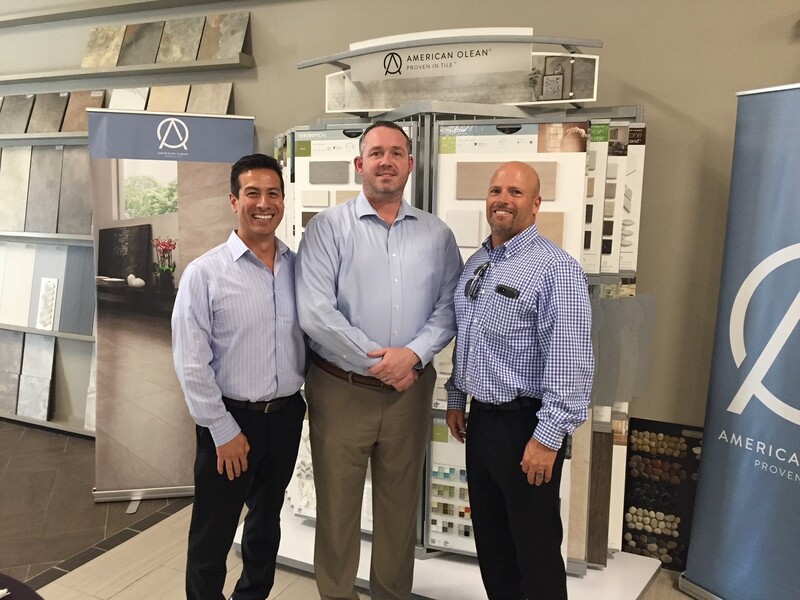 (L To R) American Olean Representatives Hector Narvaez, Dave Godlewski, and Mike Lewandowski at the new Travis Tile showroom in McAllen, Texas during its grand opening celebration. American Olean (AO) is making it easier for its distributors to expand into new territories through convenient “turn-key” stores built by AO. These turn-key facilities are part of a value-added service where American Olean executes all of the up-front financing and legwork to site survey, manage construction, and build-out the interior of a new store that will feature American Olean as its “anchor” brand. AO then hands the keys over to its distributor once the doors are ready to open for business. The eventual cost to the distributor through an easy payment plan is much more doable than shouldering the burden of up-front construction costs and the risk of a new business venture alone. This value-added service is just one more benefit to the distributor of working with American Olean, a well-established brand that is part of a large, financially-sound parent company. Travis Tile is the latest AO distributor to take advantage of this opportunity and recently celebrated the grand opening of its new Travis Tile showroom in McAllen, Texas. Travis Tile has been an important American Olean distributor for 32 years. “American Olean is serving as the ultimate strategic ally, offering distributors an easy way to substantially increase their revenue stream by expanding into new markets via AO’s turn-key showroom opportunities,” said Jamie Tyler of Travis Tile. The American Olean turn-key showroom is designed to offer a complete AO shopping experience. Displays in each store showcase the entire American Olean product line. In addition, the overall layout of each store incorporates today’s most studied principles on how consumers shop and what overall shopping experience most effectively guides consumers through the consideration and selection process. To learn more about American Olean and its latest product launches, please visit www.americanolean.com.